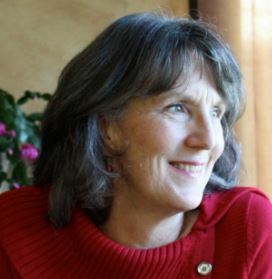 Arleen Williams is a novelist, memoirist, and co-author of a dozen short novels in easy English for adults. When not putting pen to paper, Arleen teaches English as a Second Language at South Seattle College where she has worked with immigrants and refugees for over three decades. To learn more, please visit www.arleenwilliams.com and www.notalkingdogspress.com. 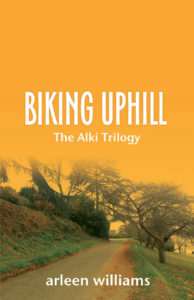 My first book was actually a memoir rather than a novel. 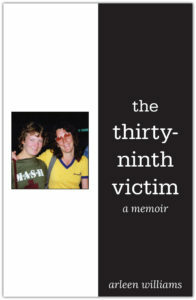 The Thirty-Ninth Victim is the story of my family’s journey before and after my youngest sister was murdered. The case was open for twenty years, and the effects on my family and myself were profound. Writing was the tool I used to make sense of my world. Little did I know that I would go on to write three novels and two more memoirs (Pub 2018 and 2019). What strange things do you do when you write? Do you listen to music? Watch television? Eat Cheetos? No quirks or rituals. I joke about my magical pen, but it is nothing more than that. Usually I create in long hand, pen to paper. Sometimes, not always, with a timer. I type up the new work and do all editing at the keyboard. If I’m working at home, I need absolute silence. If I’m in a coffee shop, I prefer loud music, the louder the better, loud enough to blot ambient conversation. If not, I start listening. And taking notes. A bad habit that has helped develop my ability to write dialogue, so maybe distraction is a good thing. Every piece of work presents unique challenges to each writer. I was speaking with an acquaintance after a reading the other night who told me she’s moved from writing short stories to poetry for the immediate gratification that come with the completion of each project. I write what I love – books. But I certainly I understand the challenge of working for months, years even, to finish a manuscript. With memoir, there’s the added challenge of memory. The simple act of remembering changes memory, especially distant memory. My current project is the story of my years as an expat in 1980s Mexico City. Talk about challenge! Fortunately, I’ve reconnected with a number of the women who shared the expat experience with me, and we’ve had the joy of swapping memories. These women and their stories have become an integral part of The Ex-Mexican Wives Club (Pub 2019). That’s easy – my youngest sister. Maureen inspired The Thirty-Ninth Victim and she appears in my other two memoirs as well. Her visit to my home in Mexico City at age eighteen in August 1982 was the last time I saw her. What would we do? I stare out the front window, pen in hand, a green wall of spring foliage between me and the street. Dogs are barking. Boys are hitting a plastic baseball. Roofers are pounding next door. I try to imagine a day with Maureen. She would be fifty-five now. A woman, not a girl. Where would life have taken her, where would she have taken life, had it not been stolen from her? What would we do with only one day? Love each other. Intensely. I have two memoir irons in the fire. I’m polishing a memoir of motherhood, memory loss, and writing memoir titled Mom’s Last Move for release later this year. I’m also doing a rewrite of my third memoir, The Ex-Mexican Wives Club. Inspiration? People and lives lived. I am an ESL teacher at an urban community college. I have worked with immigrants and refugees for over thirty years. 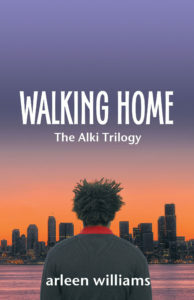 My students, their determination and resiliency despite the horrific challenges they had to overcome simply to reach my classroom and the ongoing threats they face inspired my three novels. My memoirs are inspired by personal experience and the need to explore and understand this chaotic world. I’m not good at settling into writing, and I’m not good at getting up to stretch once I do. Like right now. My back and shoulders are screaming at me to put down this pen, go for a walk, make dinner, drink a glass of water. Move! But ideas are flowing and it’s hard to stop. Starting, stopping, starting again are a challenge. Experts say a writer should think about her audience when she writes. I think of neither audience nor message. My focus is on the story I see in my mind’s eye, the story I struggle to shape into words. Still, if I look at my body of work – novels and memoirs – I would say they all carry a message of understanding, acceptance, and inclusion. We are a diverse world with deep fissures. The ability to embrace those different from ourselves with open-minded appreciation of those differences could go a long way toward peace and reconciliation locally, nationally, and internationally. Like many writers, I am an avid reader. When not reading, writing, or teaching, I cycle, hike, garden and spend time with family and friends in any combination of those activities. I was fortunate to have two gifted writing instructors. From Robert Ray, I learned to place my feet on the floor, breathe deeply and write from the core. I learned the value of putting in the seat time. Jack Remick once sent me a google image of a graffiti artist, spray can and stencil in hand, that reads: If you want to achieve greatness stop asking for permission. I believe these two acts – dedicating time to your work and allowing yourself the freedom to find voice – are essential to developing creativity. 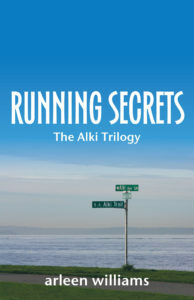 In the three novels of The Alki Trilogy – Running Secrets, Biking Uphill, and Walking Home – there are two characters I love dearly. Gemila Kemmal, or Gemi, is a middle-aged Ethiopian refugee who operates her own home healthcare business. Mama Lucy is an aging hippie, potter. Both of these women are surrogate mother figures – loving and gentle, strong and tenacious – with hearts of solid gold. Neither is perfect. Both are aware of their foibles yet willing to face them head on. Ask questions. Face your fears. Love yourself.